We knew we were having problems here, but the news that we are not alone has been confirmed as injuries at Letchworth and Welwyn have forced Hertfordshire to pull out of the U18 section of Sunday's East Midlands festival in Newark. Apparently the county squad are down to only 14 fit or otherwise available players out of 25. With Hertfordshire U18s due to play Canada's U19s (at Welwyn on 29th December - see here) the county managment felt they could not risk any more injuries by having such a small squad play every game without rest. 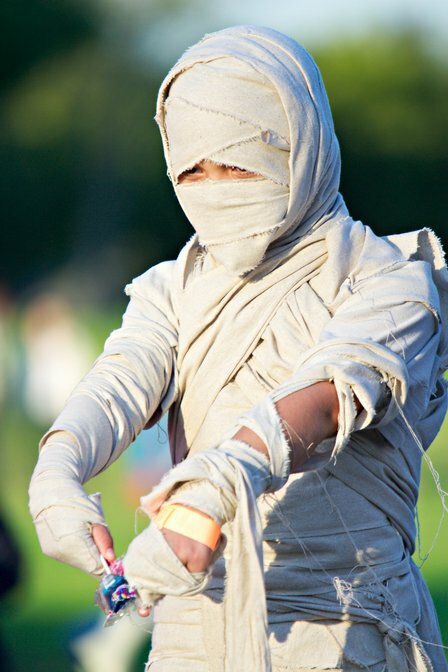 The plot, meanwhile, thickens as we learn that Westcliff also have an unusually high number of injuries to the extent that they will not be able to make the game at Letchworth on the 9th - Heather is looking for replacement opposition. Is this all just bad luck? 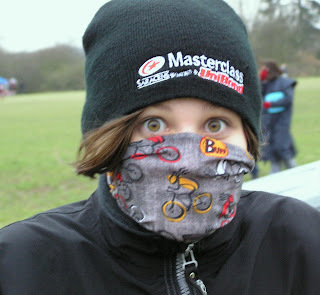 Anyway - this means that it will be training FOR ALL on Sunday at Letchworth 10.00 (t0 11.30). Who broke all the mirrors? Not that there is any evidence of large amounts of broken silvered glass everywhere, but there must be some explanation for this - for now, as well as Jess being out for several weeks following Sunday's game, Carla is now out until February due to some undisclosed off-pitch aggravation of her shoulder injury. The curious thing is that I hear that we may not be quite alone in all this. Swaffham withdrew last weekend mainly, as you will have seen below, due to injuries suffered at county level, and I hear one or two other clubs may be experiencing raised injury levels. I grant you this is hardly a scientific survey, and one will tend to hear the bad news stories, but I wonder.... what's going on? The age ranges changed this season - is this a co-incidence? That would be an irony because one major reason to change the age ranges was to improve safety. Could any aspect of the new age ranges be less "safe"? Fact is that I can't see what... and anyway at least half of our injuries have been off-field. So, just bad luck then? Or.... any ideas, anyone? Please note that, as Katie is unavailable this Thursday, U15 training will start at 6.00pm (rather than the usual time of 5.30pm). JOG? You must be kidding : Basford never slowed to a jog all afternoon! Obviously the Basford code was more complex than we had expected. There are, of course, some messages that are just too difficult for most people to decipher. Would any passing genius care to tell us what they makes of this anagram? F J K Q D B H - quite a toughie, isn't it?! So congratulations to Basford for winning both their matches (and the anagram contest!) 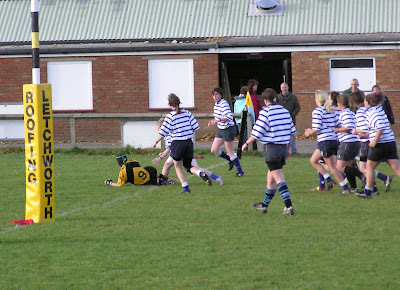 and to Paviors for their victory over Letchworth. Finally, and most importantly, everyone at Letchworth Girls wishes Basford's Sarah a full and speedy recovery from the serious leg injury she suffered in the final match of the day. 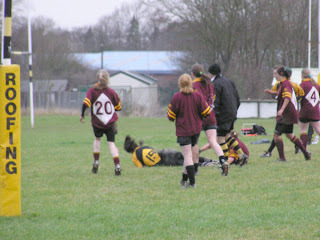 An unpleasent injury to one of the Basford players brought a slightly premature end to an otherwise competitive afternoon's rugby. Obviously we will keep an eye on the Basford blog to see how things go, but based on Sasha's account it sounded like a serious leg injury. Up until then the day had gone quite well. Our patched together team had, with the aid of a few borrowed players, performed well - starting better and maintaining a far more consistent performance than in some recent games. Unfortunately we didn't get through the afternoon without adding to the injury list, Jess's shoulder problem reviving itself in the first game against Basford but no before Jess had put in some good runs that had threatened to cut through Basford's defence. Jess went to hospital where the injury was diagnosed as a chipped collar bone - so that is Jess also now out for at least the next two weeks. 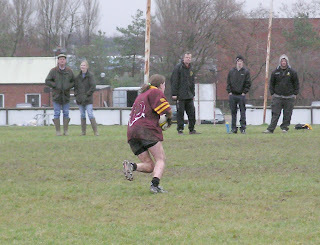 Admittedly Basford were already a couple of tries up by this stage, but the loss of Jess's speed in the centre hardly helped our cause. 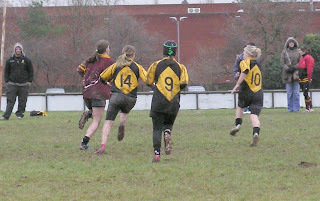 Explosive speed would seem to be the best weapon against Basford, and Sasha and Natalie both came close (particularly in the second half), so if Jess (and maybe Hayley) had been on the field then maybe we might have crossed Basford's line for the first time this season... but in the end I think most people were happy with a performance that held a far stronger opposition to only five tries. 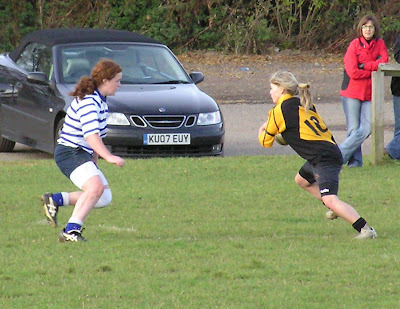 Next up was Paviors, a very different side who have always run us ragged in the past. This proved to be a very close and exciting game, 0-0 at half-time, with the deadlock only broken mid-way through the second half by Paviors, who only doubled the margin from the final move of the game. It was disappointing perhaps not to record a score on the afternoon, but in practice this would have been a pretty tough afternoon with a full strength team. Basford finished off the afternoon with a victory by a single try over Paviors, the injury bringing things to an early close. 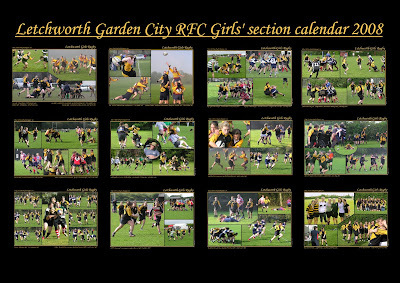 So... a final county day next weekend, with training at Letchworth for everyone else, and it would obviously be a big help for the rest of our season if we could return from a county day with as many players as we send! Quite a busy Sunday in prospect this week with the visit of 2 other clubs. For the U18s, we have Paviors and Basford visiting for a 3 way tournament. All sides seem to have a few injuries and, if you haven't done already, it is really important that you let me (Mike) know as soon as possible whether you are or are not available to play so that we can advise the visitors accordingly. For the U15s, we had invited Swaffham and Basford but, unfortunately, all three teams are ravaged by injury and the fixtures have had to be postponed. 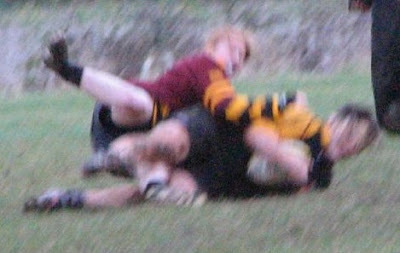 I think its worth recording on the blog our incredible run of injuries this season, both for U15s and U18s. 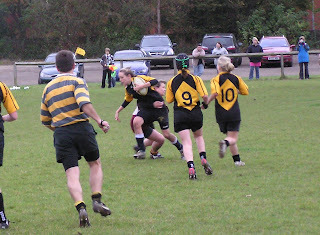 In the past we have had the odd injury that has meant someone missing a weekend of two - indeed in our first season we only had one in-season injury that caused anyone to miss a game (Katie's concussion against Welwyn), though we more than made up for that with the carnage of National Sevens! But now... I lose count. Mel, Megan, Emily, Hayley A, Anna... and now after yesterday Hayley G. Add to that the "walking wounded" - things like Rosie's knee - and its all a bit worrying. Less than half of these injuries have happened on the field, I think, but those that have - even some that seemed minor - are taking ages to heal! 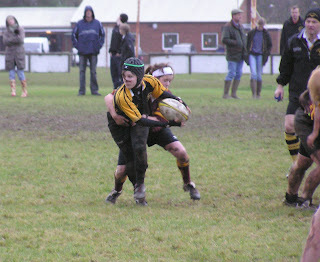 Hopefully things cannot carry on like this - well they can't as a couple more and we'd have practically no team left! - but for the time being can everyone wrap themselves in cotton wool or somesuch as fate seems to have it in for us at the minute! 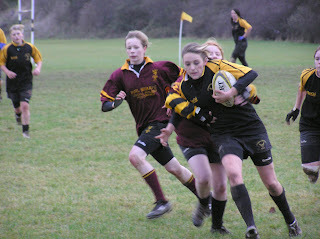 A couple of recognisable faces among the county girls U12 team, winner of their tournament at Hitchin on Sunday. 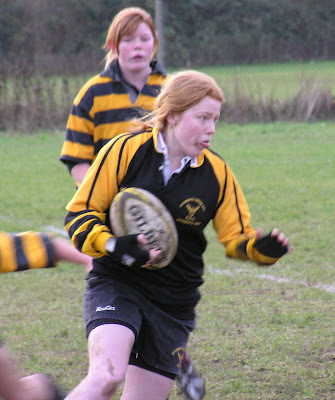 Our own Philippa played a major part on the field, while the team was molded into shape by Natalie who put into practice everything she has learnt from Joe and Simon over the past couple of seasons to build a winning team. Perhaps as a result the team that played a bit like Letchworth, starting their first game against Kent to score by allowing the opposition to score two tries in the first minute before finally waking up to win 30-10. 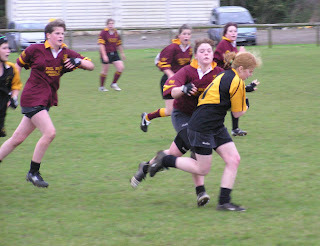 The second game saw them beat Middlesex 20-0. It should not go without mention that there was a third Letchworth contributor to the triumph - the stylish county shirts the girls wore being produced by Mike Alcock. Tonight we have exclusive news from our undercover reporter in the Hertfordshire camp at the Essex Inter-County tournament at Harlow. It is often said that a picture is worth a thousand words but never before has that expression been more deserved. ... OK, Hayley, is there anything you want to tell us? I almost forgot - the results! In a four county tournament, Herts U18s beat Leicestershire (12-0), drew with Eastern Counties (5-5) and narrowly lost to Essex (0-5) and finished the day as runners-up to deserving winners Essex. In the U15s tournament the top two places were reversed with Herts retaining the title they won last year and Essex being runners up. 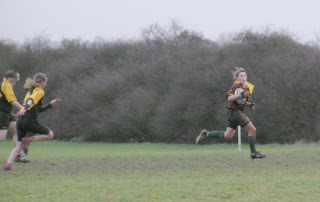 Combine rugby and Christmas shopping? Doing anything on Saturday 8th December? Anyone fancy a team day out to Watford to watch Saracens take on Viadana (from Italy) in the Heineken Cup... and maybe do a bit of shopping as well? 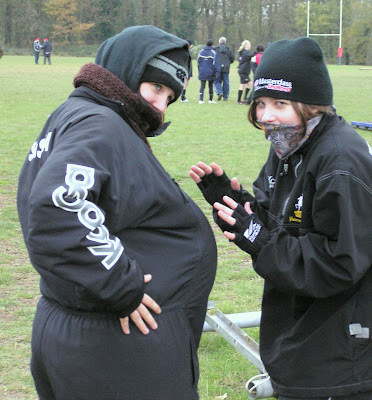 Saracens are inviting anyone connected with women's and girls' rugby in Hertfordshire to come along and enjoy it for HALF PRICE* - that's JUST £10 for an adult ticket, and £5 for juniors (U16). Kick off is at 3pm at Vicarage Road Stadium, Watford. . To buy your tickets call the Ticket Team on 01923 475222 quoting "Ladies Rugby Offer". Offer closes 5pm, Friday 7th December. There will be World Cup stars in action, plus there's as much entertainment off the pitch as there is on it, including cheerleaders, face painters and giveaways, meaning there's something for everyone! What is more, if you haven't been before the stadium it is barely 5 minutes walk from the centre of Watford and the Harlequin Centre - so it is a great chance to combine a team "day out", top-level European rugby, and a bit of Christmas shopping. So - who is up for it? *Half price tickets will be situated in the South Stand and offer a 50% saving on the matchday price. Of course, we will only gain benefit from the new arrangement if players actually turn up on Thursday evenings so it is really important that everyone comes to training regularly. 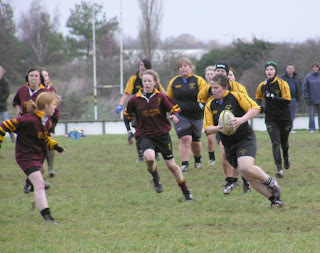 This is especially true for the U15s where Katie is hoping to be able to bring along some new players in the near future. 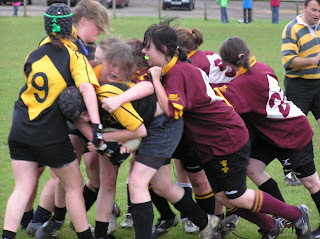 Following our very successful tour to the South-West last Easter, we are now trying to finalise plans for the 2008 tour to the North-East where there are a very large number of thriving girls teams. The most important part of any tour is, of course, the players that go on it and, in order to progress the planning further, we need to gain an understanding of how many players are likely to be interested/available for a tour during the Easter holiday. Simon will be discussing this at training on Thursday and it would be a big help if you could let him know if you are likely to be interested and when you are available. It was not a great first half, was it? Perhaps best forgotten - but then maybe not because this is not the first time this season we have started a game half asleep, and then paid the price. We have to stop doing this - do we need to look at our pre-match routines, maybe? Okay - we are suffering from more long-term injuries at present than we have ever had before, but our patched-together pack of forwards actually did very well, at the set-pieces at least. But from the start of the game - where we gifted Kettering a three-player overlap by not being ready for our own kick-off - through to the "full and frank exchange of views" at half-time it was, lets be honest, a bit of a shambles and probably the worst we have played since the visit of Mid-Warwickshire in 2005, if not before. 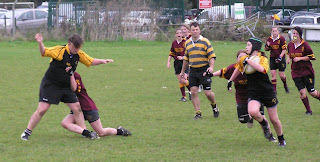 34-0 was not an unfair scoreline by an means. It took a passionate appeal from Katie at half-time, plus a talking to from Simon, to turn things around. And what a different team that produced, only narrowly shaded out 10-5 over a second period that was far more even - and which, if the ball had gone to hand just once or twice, might have gone the other way. Arrangements for Sunday are as follows : please meet at the club at 12.45pm to be ready for a 1.00pm warm-up and 1.30pm kick off. Can those few players who have not yet told Mike, John or Simon of their availability, please let us know a.s.a.p. 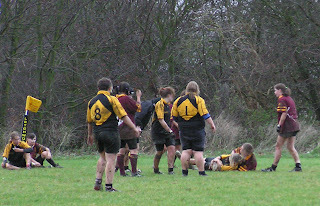 as we need to advise Kettering of our squad size for the match. 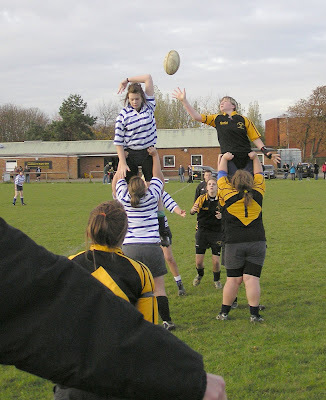 This weekend we have an U18 match against Kettering at Letchworth and the U15s, who are also at Letchworth, are training with Ampthill in preparation for the matches against Swaffham and Basford on November 25th. It is essential that we get a good turnout for the weekend - and for training on Thursday - because we will need to be at our best to take on Kettering, Basford and Swaffham over the coming weeks. Also please note that we intend to take a 2007/8 Girls' section photograph (combined U18 and U15 squads) before the match/training on Sunday. Will all players please confirm their availability/non-availability for both Thursday training and Sunday 11th November to Mike as soon as possible. 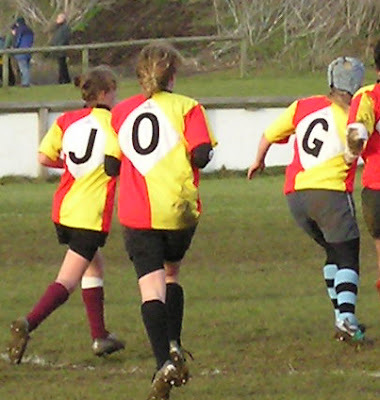 The RFUW want to hear from anyone involved in women's girls rugby and have prepared six surveys, each tailored to paticular groups - Administrators, Coaches, Parents, Players, Supporters and Volunteers. You have until the 18th January 2008. Training at Letchworth this Sunday!! 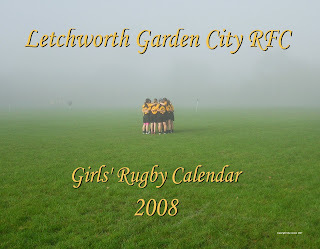 With the majority of you not involved in county action this Sunday several girls have asked if we could have a training session at Letchworth this weekend, and potentially on the other two county weekends coming up before Christmas. If you can make it on Sunday please let Simon know. 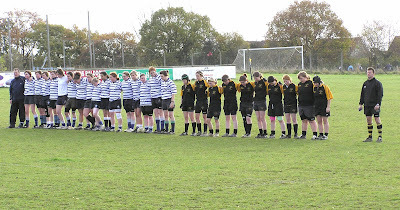 I think this is a superb photograph - expressing everything rugby (and sport) should be all about. 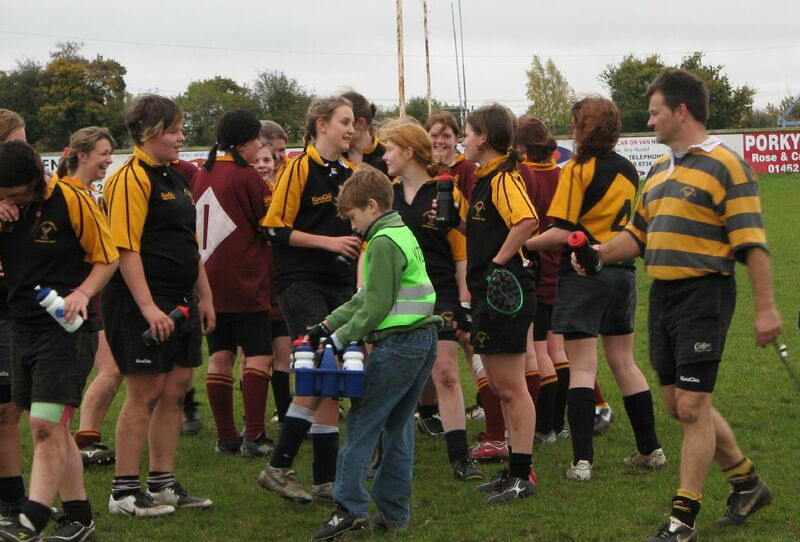 Two teams smiling, shaking hands and mixing well at the end of a hard game. Brilliant. With two of the next four weekends taken up with county tournaments November will unfortunately be a bit thin for anyone not in county teams. 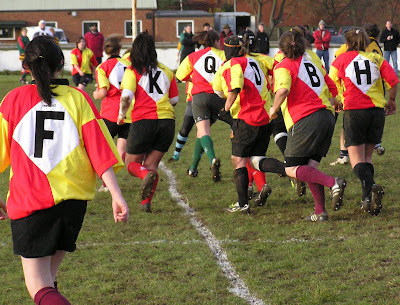 In addition Kettering do not (as we know from last season) have a U15 team. But its not all bad news. 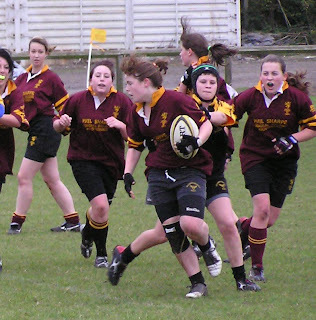 There is a great weekend to build for at the end of the month when both Basildon and Swaffham will visit - both with U15 teams - so you are guaranteed some good rugby. For the Kettering weekend we have suggested that Ampthill bring their U15s over (after being unable to do so this weekend) partly so that we might have contact session together ahead of the Basford/Swaffham game. 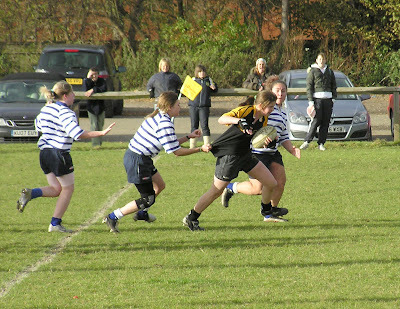 Their U15 coach was not around yestrday, but the U18 coach did say that the younger girls at Ampthill are desparate for a game - so it is something we will be working on. 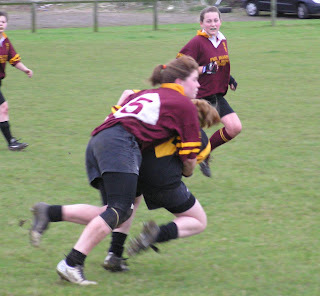 It can be quite difficult playing a game against less experienced sides. Everyone expects you to win easily, so whatever you do - in a way - you "can't win". Its also a difficult balancing act as you do not want to completely destroy an up and coming club. Despite that I think we got it about right yesterday. Charlie and Nikki in particular were brilliant ambassadors for our club, playing the full game for Ampthill as hard - if not harder! 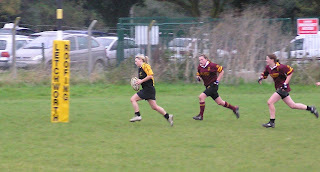 - than ever, with Charlie scoring a try and Nikki on just falling short - Jess catching her just before the line. But it was not just them. 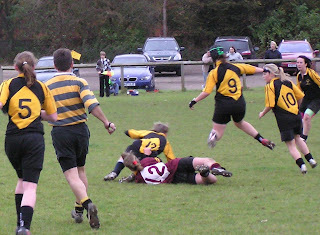 Ampthill clearly have the potential to be a good side - there are some talented players there who lack only experience, experience that meant that they often reacted just a fraction of a second slower to situations - which makes all the difference, especially with someone like Natalie around, grabbing two more tries by simply reacting faster to loose balls. It was noticeable how much they improved as they game went on - the second half was fairly even until the final few minutes when perhaps match fitness told. 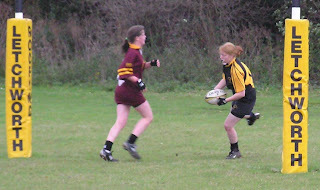 If the Ampthill girls are given regular fixtures I think we will find that future meetings will be much closer. 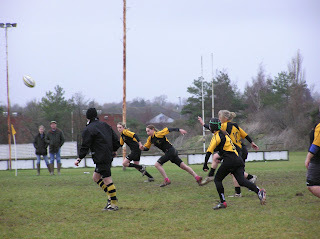 For Letchworth, it was a chance to use various back moves and it was good to see the ball moved wide. 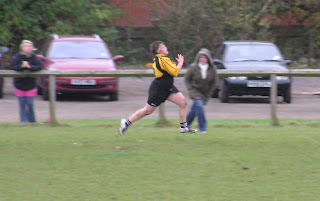 Jess was always dangerous - and not only in attack, but her tackling was good as well - while Sasha showed a remarkable turn of speed for one of her longest sprints to the line ever. 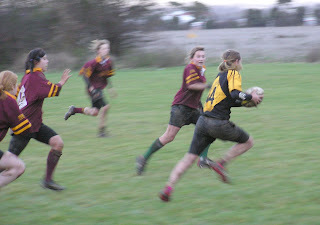 Ruby also made her mark ("their fly half is really aggressive!" 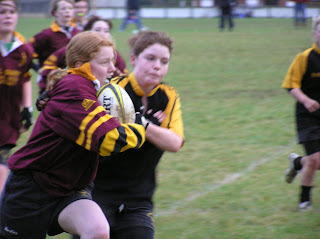 I heard one of the Ampthill girls say). 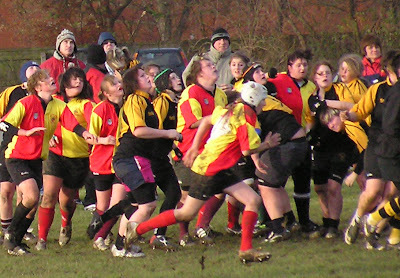 The pack was predictably dominant, though a few scrums were lost maybe because people relaxed a bit - a dangerous thing to do against any opposition. Finally a word of praise for everyone's behaviour after the game as well - it was good to see both teams sitting down and mixing together so well afterwards. 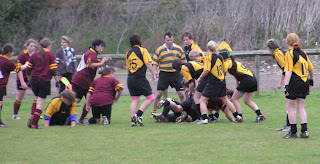 Rugby is more than just what happens on the field. Looking ahead just as we are getting going its county for two of the next three weekends, but other than that November promises to be a taxing month with home games against Kettering and Basford - we won't be able to relax against them! 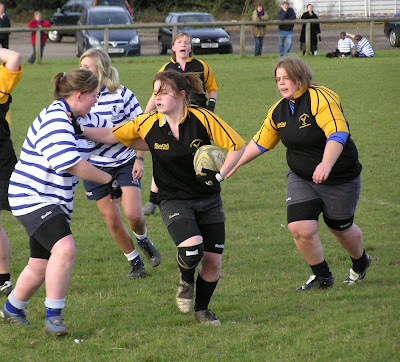 Here Katie looks surrounded by Ampthill players while Nikki appears to be distracted by someone mentioning free ice-cream or somesuch. Anybody know what dance this is ? 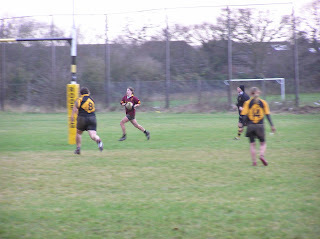 Letchworth's new winger breaks away for a try - well done, Dasha! Sorry, that should read 'Sasha'.